Taiwan-based manufacturer HannStar has recently made available the Hannspree SN12E24B7P, a 12.1-inch netbook that runs on a 1.3GHz dual-core Pentium SU4100 CPU instead of a more common Atom or Fusion processor. Outside of the CPU, the hardware specs are fairly ordinary for a netbook including the GMA 4500MHD graphics, 1366x768 screen resolution, 2GB RAM, 320GB HDD, HDMI, VGA, 3x USB 2.0, 3-in-1 card reader and a 1.3MP webcam. Bluetooth, unfortunately, is overtly missing. Battery life is listed for around 6 hours from its 6-cell module. Overall, the netbook is about 1.25 inches (31.75mm) thick and weighs in at about 3.4 pounds (1.54kg). 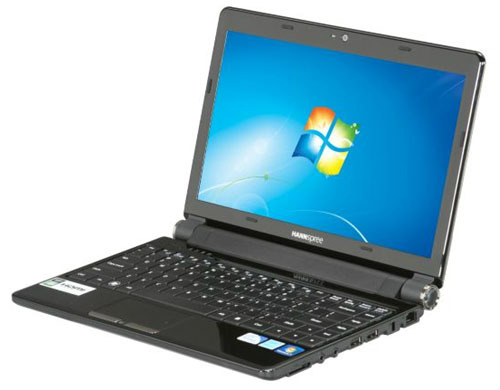 The Hannspree netbook is available now for $349. The company had announced an Android Honeycomb tablet earlier in the year, but the device has yet to see a release.